The phenomenon of a musician dying young is, unfortunately, not so rare. All areas of music are poorer for having lost the talents of major artists who would have made an even greater impact had they lived out their maturity. Although our thoughts normally focus on rock and jazz musicians who flamed out early, classical music, too, has shared in such losses. Indeed, it is likely that the fields of conducting, violin and piano all would have been topped nowadays by artists who died decades ago. Ginette Neveu, a phenomenal violinist, and Guido Cantelli, Toscanini's only protege, both were killed in air crashes en route to concert engagements, victims of an urge to internationalize their nascent careers. Neveu and Cantelli, at least, were spared knowledge of their fate. 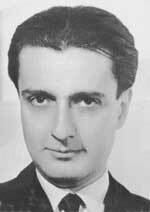 Dinu Lipatti was forced to confront his. Lipatti was born in Bucharest in 1917 to a family of musicians. He gave his first concert at the age of four and was destined to become a great pianist. His teachers were the cream of classical culture: pianist Alfred Cortot, conductor Charles Munch, composer Paul Dukas, and finally Nadia Boulanger, arguably the most influential mentor of the century. He withdrew to his native Roumania for private study during most of World War II, and then escaped to Switzerland in 1943, where he taught and made his home. After the War, just as he had arrived in the pantheon of great performing artists, Lipatti was diagnosed with leukemia. Producer Walter Legge urged him to record. His entire studio legacy barely fills 5 CDs (available separately at mid-price and packaged together as budget-priced EMI set CZS 7 67162 2). Among the highlights are Chopin pieces and a justly famous reading of the Grieg Piano Concerto with the Philharmonia conducted by Alecio Galliera. 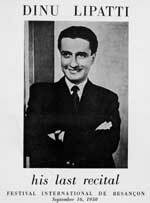 The hallmark of Lipatti's artistry, in Legge's phrase, was "softness through strength." Lipatti projected enormous character, but without virtuoso display. Rather, his delicacy was direct and under firm intellectual control. His artistry was modest and without ego: although he loved Beethoven and died listening to records of the quartets, Lipatti felt himself unworthy of performing Beethoven, and insisted that he would have to study the "Emperor" Concerto for four years before he was willing to play it. But time was the one thing Lipatti did not have. By 1950, he was gravely ill. One of his very few recorded live performances, a Schumann Piano Concerto, sympathetically accompanied by Ansermet and the Orchestre de la Suisse Romande in Geneva on February 22, 1950 (on London CD 425 968), seems an ethereal wisp. In June he rallied from experimental cortisone treatments enough to record his acclaimed studio version of the Chopin Waltzes and to give a surprisingly strong Mozart Piano Concerto # 21 with Von Karajan at the Lucerne Festival on August 23 (included on the EMI CDs). But then Lipatti's remission ended, his strength evaporated and he was forced to confront his imminent end. Despite the urgings of his doctors, Lipatti insisted upon one last recital. The program would be a handful of his favorite works and the setting would be the intimacy of the music festival to be held at Besançon, France. As his wife Madeleine recalled, this was the only way Lipatti could bear to take his leave of the world, since, "For him a concert was a pledge of his love to Music." Other mortally ill artists have left us legacies of final concerts that may have had deep personal significance but on purely musical terms really never should have happened. Perhaps the most pathetic was Leonard Bernstein's appearance with the Boston Symphony in September 1990, a genuinely dreadful performance without even a hint of his former expressive powers. Lipatti was so weak he could barely walk to the piano. But once he began playing, he became transformed. Despite his youth, Lipatti poured into his performance a unique wisdom, a distillation of everything he had lived for. He knew that this would have to stand as his final statement as an artist and that there could be no afterthoughts or retakes. As fine as were his studio readings, he achieved a genuine transcendence at Besançon. Perhaps the greatest tribute to Lipatti is that listeners can easily forget the poignant circumstances of this concert. The playing is nearly note-perfect, each piece is brilliantly conceived, and every phrase is alive with inflection, deeply expressive but under perfect emotional control. The only hint of trouble, and a very subtle one at that, is that Lipatti played only thirteen of Chopin's set of fourteen waltzes; realizing that he lacked the strength, he did not even attempt the last one but instead ended the concert and his artistic life with a short and soft Bach chorale, the final prayer of a consummate musician. When first issued in 1957 on LP (Angel B 3556), the dim sound in those hi-fi mania days led to respectful, rather than ecstatic, reviews in comparison to Lipatti's sonically superior studio versions of all but the Schubert. Unavailable for nearly three decades, the recital is now back on a single mid-priced CD. The CD sound is much brighter and more immediate, but seems slightly inappropriate to the occasion; the diaphanous sonics of the LPs were hauntingly compelling, as if to provide a suitably discrete distance between the listener and the artist who, under these circumstances, seemed entitled to a degree of privacy within which to confront and overcome his stifling demons. In an apparent effort to avoid breaking the sustained mood, the CD chops off the applause that followed each piece on the LPs, resulting in an abrupt release of each final note rather than the natural decay of the concert hall. Also edited out is a poignant moment: before beginning the Bach Partita, Lipatti "tested" the piano with an ascending scale, as pianists often do before a recital, but his fingers collapsed on the fourth note. Rather than a mere embarrassment, this flaw helps to explain the weakness of the attack of the opening phrases of the Partita. It also throws the perfection of the remainder of the recital into a breathtaking relief, and serves as a reminder of the magnitude of the will power which Lipatti mustered to conquer his severe physical problems. As with many other volumes in their "Références" series, EMI includes beautifully poetic program notes by André Tebouf, arguably the finest of all writers of this type of material. Inexplicably, though, his French reverie is untranslated, and English readers have to plod through a far more pedestrian essay. But no matter -- this CD documents not only one of the greatest recitals ever recorded but an overwhelmingly emotional monument to the strength of the human spirit. In the words of Madeleine Lipatti, it serves to recall "an extinguished star whose fire still gives us light."